But outside of a name that most people probably overlooked, there was nothing else to really look at. The name of a location in-game isn’t the same thing as a weapon or pet whose models can be datamined. Plus, the name being among dozens and dozens of others just like it makes it incredibly easy to overlook and just assume it’s an area that already exists. All of which is to say, it’s entirely thanks to random chance that I actually stumbled upon Jewelhammer’s Vault, the Titan vault hidden beneath Alcaz Island. I happened to be testing professions in Kalimdor when I noticed a water elemental stuck beneath the ground. For fun, I decided to use Mind Vision on this water elemental. For even more fun, I decided to look around beneath the world while I was doing so. And that’s how the giant cave I would soon realize was Jewelhammer’s Vault caught my eye in the first place. Enough talking, what’s it for? Background story aside, there’s not a whole lot to the vault itself. 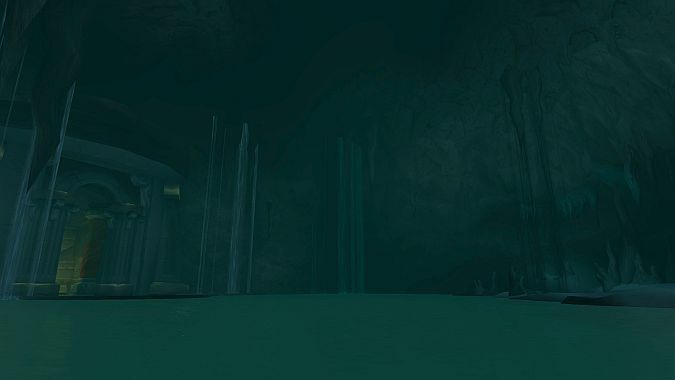 Reaching it requires swimming beneath the northern end of Alcaz Island and making it a decent way into the Fatigue bar. 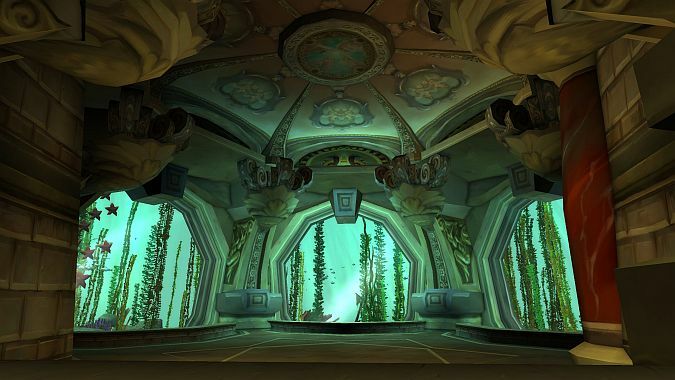 Once you’re inside, it’s a mirror image of the cavern Priests trekked to for their class mounts. If you’re not familiar, it’s basically a very large cavern with a small patch of land to the right, and a Titan-looking entrance to the left. One of these things is more interesting than the other. The Titan portion of the vault is one we’ve seen in several places before. 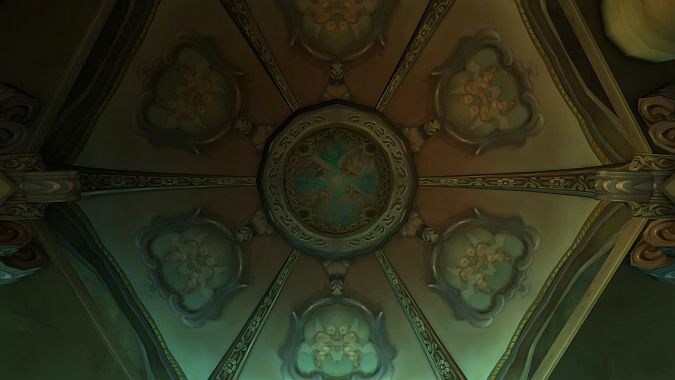 It’s essentially a glorified fish tank with naked angel babies on the ceiling. Super cool stuff! Still, being a mirror of Titan facilities we’ve seen before doesn’t exactly clue us into the place’s true purpose. But else something might. I mean, it would be cooler if it actually had something in it, but it’s still intriguing all the same. Also intriguing? The fact that there’s a Jewelhammer’s Focus item being added in Battle for Azeroth. It’s a Jewelcrafting item, and there’s no indication as to what it’s for — but having another instance of “Jewelhammer” is more than a little curious. Perhaps this Titan vault is just going to be a small little bonus for Jewelcrafters, sort of like the extra room Alchemists can go to in Vault of the Wardens. Or perhaps Jewelhammer’s Vault isn’t related to the Focus at all, and we’ve instead stumbled upon an old-world update to be used for one of Muffinus’ secrets. It wouldn’t be the first time he’s done this, after all. Whatever the case, I’m always a fan of secret old-world updates like this. It’s especially cool knowing these things can be added without any real indication Blizzard’s done so. 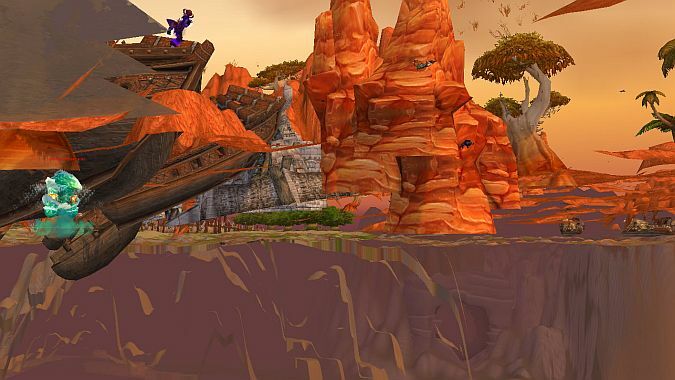 Unlike mounts, pets, and other goodies, locations in the files only give us so much to work off of. Time will tell what the vault’s actual purpose is — for now, feel free to speculate away in the comments!